Best Psytrance album so far. This is a game changing in the history of the scene. Everytime i listen to it, it surprises me and i get astonished by the maestria of Astrix. The transitions are unpredictable and the album in general doesn't fall in weird and unecessary manipulations and breaks. I agree with Antic here. There are better Full On album out there, this one is mainly getting famous because of Marketing, Commercial Appeal and Production. Apart form that nothing ground breaking or new here. Mainstream and far from being a jewel. Agree with positive reviews about this album - an absolute psytrance treasure chest. Many many years of blissful listening will be experienced from these tracks. Amazing stuff and timeless release from one of psychedelic music's godfathers!!!! ..... So I've now listened to he.art around 10 times, and was compelled to come back and add to my review. This album in my belief will certainly take its place as one of the top psytrance releases of all times. 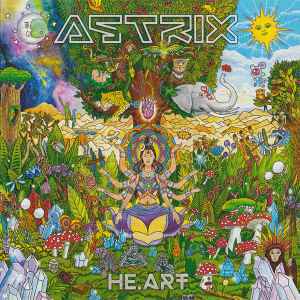 I certainly understand why there has been a 7 year hiatus between Astrix's previous release and this one. Even if I had an entire lifetime I would not be able to create such a meticulous, cohesive and stunning 9 tracks. It's the kind of music that never becomes background, it compels you to listen and each listening takes you deeper and deeper. Thanks Avi Shmailov - a crown jewel in the psychedelic music genre. Nothing more to say a great album and a jewel of psytrance. Seriously represents everything from the psytrance ... psychedelia, depth, surround sound, in short psytrance. Highly recommended for any lover of the genre. If you're looking for something similar - a prog-influenced melodic full-on - but better, try U-Recken's "Flames of Equilibrium" that even if not perfect is miles ahead in style and execution. 3/5 on a good day. Artcore was a milestone in psytrance, now He.Art is crushing it. Pure gems in sounds, nice and deep vibes, a wonderful voyage! This guy is above everything made in trance. Simply the best producer ever in trance music! This is a must have in your collection even if you are not fond of psychedelic trance. Truly a Masterpiece - High Qualitiy Sounds - every Track is a own story - Thanks!! !